Hanoians are choosing to escape the sweltering temperatures and choosing to go fishing in the evening instead. Hiep, a regular angler at a fishing pond near Da Ton Dyke in Gia Lam District said he eagerly fished for big catches. "When we're too busy by day, we go fishing at night. Fishing not only gives me time to think, but it also make me calmer." At the weekend, Tam and his friends travel to the Dam Vac tourism area in Vinh Phuc Province for fishing. They choose the site because of its vast ponds and big fish. "Fishing at night time is a little spooky because of cries from the herons. Sometimes, they suddenly fly right by us." Tam said. Despite the spooky atmosphere, many pro fishers still choose to operate after sun set for the cooler, quieter atmosphere. Once hooked, it's hard to give up the hobby. An angler with nickname 'laohac' on an online forum at forum.hanoifishing.com said that although he was attacked by mosquitoes, fell into the pond and scared by snake and finally, when he got home, was scold by his wife. But the angler said he wouldn’t give up fishing and invited friends to join him. "It's already in my blood." he said. 'Fishing is an art, the angler is an artist and the rod maker is a genius.' is a fond saying among anglers. Anglers want to catch big fish, the owners want to limit their losses and make profits so various measures have been applied. While many go fishing during the summer, in order to keep customers coming and prevent losses, the pond owners have to buy fish in the market and release them in the pond. However, pro anglers know where the big fish can be found, meaning the owners have to regularly restock the ponds. One of the methods the owners often use is to throw rotting animal intestines into the pond to distract fishes from the bait. The anglers are usually also scared away from the smell. Another method is to throw calcium carbide into the water to ward off the big fishes from the anglers. Cuong, a fishing bait genius is attributed as causing some serious losses to pond owners and Huy, a pro angler, attracts the fish by using pig manure. He shared, "Keep the manure in the sack then throw it in the pond. After 30 minutes, you'll have a school of fish." Some fish pond owners have opened side businesses to earn more money. To offer their services, owners have designed and put up about 20 huts near the ponds for couples. Outside, near the fishing areas in Gia Lam District is a series of guesthouses where anglers can catch other 'fish' with their rods. A story that circulates angling circles claims a zealous angler ran out of one of the nearby guesthouses stark naked upon hearing that some people had caught a four kilo fish. 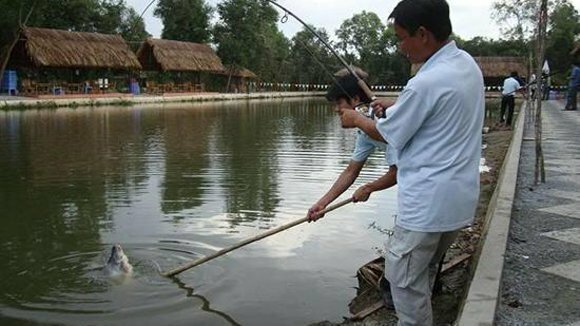 The fishing pond at Chien Thang in Thanh Tri District was known for its quiet atmosphere but in reality it was a hideout for drug users and gangsters at night. The drugs were mostly sold by the pond owner who was arrested by the local police.